Today we shall discuss a few questions involving electromagnetic induction. Questions in this section are generally interesting and we have discussed many typical questions on various occasions on this site. V = ∆Φ/∆t where ∆Φ is the change of magnetic flux occurring in a small time ∆t. (2) A long straight power line carries a current I which decreases with time at a uniform rate. A plane circular conducting loop is arranged below the power line as shown in the figure. Which one among the following statements is true? (a) No current is induced in the circular loop. (b) A uniformly decreasing current is induced in the loop. (c) A uniformly increasing current is induced in the loop. Since the current in the power line is changing, the magnetic flux linked with the circular loop is changing. Therefore there must be an induced current in the loop. The induced current in the loop must be steady since the rate of decrease of magnetic flux is steady (because of the uniform decrease of current in the power line). The magnetic field lines produced by the current in the power line are directed normally into the plane of the loop. Since the current in the power line decreases with time, the induced current in the loop must supply magnetic flux lines in the same direction, in accordance with Lenz’s law (for opposing the reduction of the flux). Therefore the induced current in the circular loop must flow in the clockwise direction [Option (e)]. (3) Two horizontal conducting rails AB and CD of negligible resistance are connected by a conductor BC of resistance R. Another conducting rod PQ of length L and negligible resistance can slide without friction along the rails (Fig.). The plane ABCD is horizontal and a constant magnetic field B tesla acts perpendicular to the plane ABCD. A small constant horizontal force F is applied on the slider PQ perpendicular to its length so that it slides with a constant velocity ‘v’. What is the value of the velocity v? On applying the force F, the rod PQ starts to move from rest with an acceleration. When the rod moves the magnetic flux linked with the circuit PBCQ changes and an emf is induced in the circuit. Obviously this is the motional emf BLv. [Note that when a conductor of length L moves with velocity ‘v’ at right angles to a magnetic field of flux density B, the motional voltage generated between its ends is BLv]. Since we have a closed circuit PBCQ, the emf BLv drives a current ‘I’ through it. PQ is therefore a current carrying conductor moving at right angles to a magnetic field. A magnetic force ILB acts opposite to the direction of motion of the conductor (in accordance with Lenz’s law). The opposing magnetic force goes on increasing with the increase in velocity of the conductor until the magnitude of the magnetic force becomes equal to that of the applied force F. The conductor thereafter continues to move with the terminal velocity acquired by it. The velocity of the rod after the initial accelerated motion is now constant. 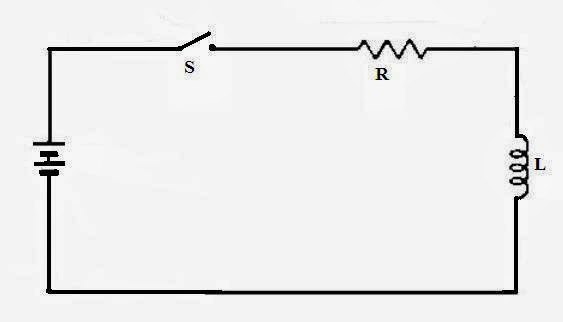 (4) An inductance L and a resistance R are connected in series with a battery and switch S as shown in the figure. The switch is closed at time t = 0. 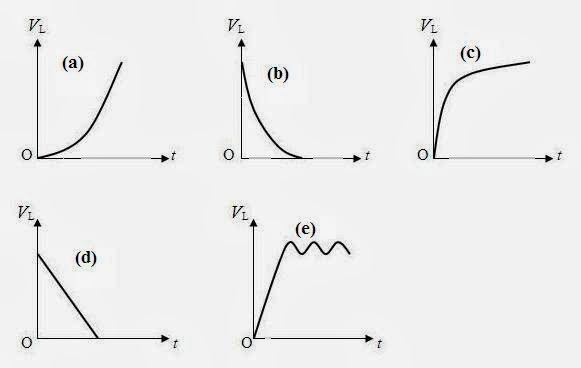 Which one among the following graphs gives the variation of the voltage VL across the inductance as a function of time t? There will be a voltage drop across the inductance only if the current in it changes. When the switch is closed the current in the series LR circuit will rise rapidly initially and will finally settle at the final maximum value. Since the rate of variation of current is maximum initially, the voltage induced in the inductance is maximum initially. The rate of variation of current is non-linear and finally becomes zero. Therefore, the emf induced in the inductance finally becomes zero and the variation of the voltage VL across the inductance as a function of time t is correctly represented by graph (b). [Note that graph (d) is incorrect since the variation of the voltage is linear]. You can access all posts on electromagnetic induction on this site by clicking on the label ‘electromagnetic induction’ below this post. Your Blog Is Very Nice About Your Knowledge.Share Your More Experience.